Wanting a standing desk still seems so strange to me. I worked years in retail, when sitting was strictly verboten and I would stand for 8-10 hour stretches at a time. I certainly don’t want to go back to those days, but I had been finding that after sitting all day I was tired and sore, and by 2-3 in the afternoon at work I was feeling like I could not possibly sit another minute. Thanks to my work’s ergonomics committee, I was able to get a standing desk, and it has made a huge improvement in how I feel towards the end of the day. I like this particular model because the whole thing goes up and down, so if I need to do something away from the computer (sketch, read) I can do that at the other end of my desk. (My coworker has a different type called an Ergotron WorkFit just for her computer, which is pretty neat too.) I can also adjust it lots of places in between, which is super useful–I like it a little lower for typing on the computer and a little higher when reading, drawing or writing. So far I have been mostly sitting in the mornings and standing after lunch, though it depends on the day. I find when I am working on a particularly difficult programming problem I like to sit, as if simply standing takes too much brain power away from the task at hand. Alternately, I like standing when sketching out ideas or reading. Sometimes I take short sit breaks when I need to think about a problem, which is nice because it gets me away from the computer, even if only by a few feet. If I have lots of meetings in a day, I will just leave the desk up, since I have lots of time to sit. Some have recommended an anti-fatigue mat under it, but since I tend to go from sitting to standing often, I think I will look for some better/cushier shoes instead. So far I have not had any foot pain, but there is slight discomfort after standing several hours. I am very thankful that my work is invested enough in the well being of their employees that they 1: have an entire committee dedicated to making sure people aren’t unintentionally hurting themselves, and 2: back that committee with money so people can get new chairs, desks, monitor risers, etc. when needed. Several years ago I also got a new chair thanks to the ergonomics committee, the first I have ever had that is made for a smaller person like me. It too made a big difference in my overall comfort at work. 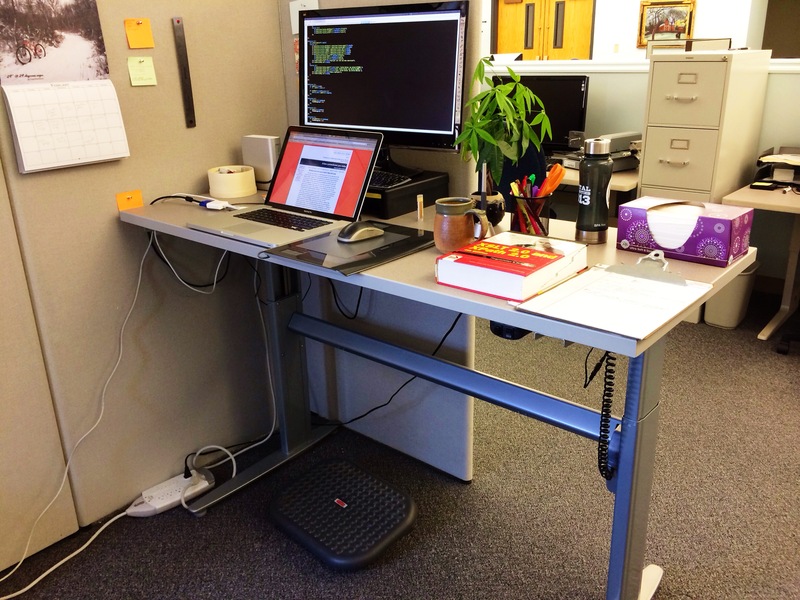 This entry was posted in Tech and tagged ergonomics, standing desk, work.